Alexander was born in Omsk (a city in the Siberian region of Russia), but lived in Tatarstan in his childhood and youth. Once he got his high school diploma, he went to the Military Aviation Engineering Academy in Kiev. In 1992, he graduated majoring in “Use of radio-electronic equipment in aircrafts”. During his education, he was an active programmer. He participated in many scientific projects and upon graduation found employment with the Department of Applied Mathematics. In 1993, Alexander worked in the Kiev office of the Danish consulting company, Time Manager International, as the head of the Department of Computer Technologies. In 1994, Alexander and his friends created Mac Center, a dealer of Apple Inc., which was originally a department of a larger company UPTC Machinery. In 1996 Mac Center became a separate company. The company provided the following services: delivery and set up of publishing systems, computer animation systems, and nonlinear video editing systems. In 1999 Alexander created Badge Master, a company that produced souvenir items from metal. In 2001 Badge Master united with the company Heraldmaster and operated under the name Heraldmaster. 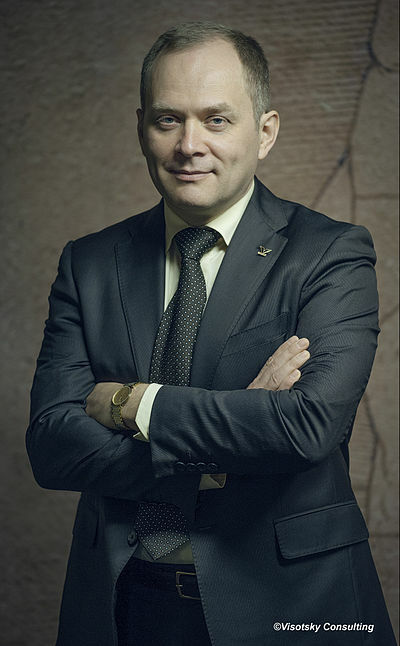 From 2001 till 2007 Alexander was the Chairman of the Board of Heraldmaster and up until 2006 he held the position of General Director of the company. Under his direct management, Heraldmaster went from operating locally out of a small workshop to becoming the largest medal and trophy producer in Europe. In 2007 Alexander sold his shares of Heraldmaster to Anatoly Shian, the co-owner of Heraldmaster and an Honored Art Worker of Ukraine. In 2005 Alexander began working as an administrative management consultant. He offered his insight at seminars in regard to the creation of management systems for small and medium-sized businesses in Ukraine, Belarus, Russia, and Kazakhstan. He formed a partnership with Andrey Rublevskiy, a famous business coach, and together they created the Productivity School training company in Kiev. From 2005 to 2008, Alexander’s Productivity School provided training services and seminars to executives of companies in different fields. During this period Alexander continued to expand his executive consulting services, in regard to the implementation of management tools throughout Ukraine and Russia. In 2008 the Productivity School training company changed its name to Visotsky Consulting. Since 2011 Visotsky Consulting has been a member of The European Business Association(EBA) The company’s office in Kiev is a member of the Chamber of Commerce of Ukraine. In 2011, offices in Moscow and Khabarovsk began providing services. In 2013 Visotsky Consulting continued to expand with new offices operating out of Dnepropetrovsk, Tumen and Almaty. In 2012 Alexander published his first book, A Job Description for the Successful Entrepreneur. In 2013 his second book, Organization Structure, came out. In 2014 he published his third book, Small Business, Big Game.